There really is No Hassle! No Mess! and No Fuss! when you host your party in our Party Room at The Lab. All you need to provide is the birthday child, excited kids and the cake! The Mad Scientist will be your party organizer and take care of everything for you including serving the cake. Your Mad Science show, refreshments and present opening will take place in the same room. Your Mad Scientist will manage the party flow to ensure you and your guests have enough time to enjoy the full experience. The entertainment portion of your party will begin 15 minutes after The Party Room at the Lab opens and is clearly designated as the Show Start Time on your Confirmation. Depending on the age and number of your guests, this entertainment will last approximately 45 – 60 minutes. Grand Finales you have added to the party will take place next. Each Grand Finale requires approximately an additional 10 to 15 minutes. Our years of party experience tells us that it is best to keep your total entertainment time to under 1 hour and 15 minutes. The remainder of your time in The Party Room at the Lab can be used by you for refreshments and opening presents. Mad Science has performed hundreds of parties using this party flow. Relax! 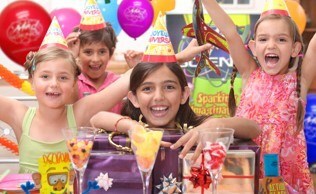 and let our staff treat you to a no hassle, no fuss, no mess party - so you can enjoy your child’s party for a change!